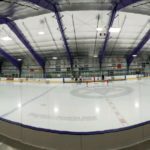 The rink on Martha’s Vineyard was approaching 50 years of operation. 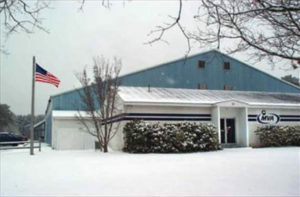 The rink itself over the years had had several updates mostly with volunteer labor with an eye for frugality. 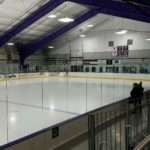 The front warming area was tired and did not meet the present needs of the Youth Hockey and Figure Skaters. Toilet rooms were defunct and unusable and no concession stands existed and the pro and skate shop were mere closets. Boards, lighting and stands constructed of wood were substandard. The refrigeration plant was an older R22 plant that had been converted to evaporative condensers along the way and contained a large charge. 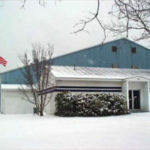 It cohabitated with the Zamboni and there was inadequate room to separate its use without an addition to the building. The cold floor and apron was a roll out mat system with multiple leaks and the apron had multiple trenches and varying levels. The Zamboni gate opened into the overhead door area and was an issue with inadequate opening size being struck by operators. The facility was in need of an overhaul and upgrade. The ice consultant and architect broke the scope into two pieces the exterior, entries, warming area and sprinkler systems would be under a general contractor. 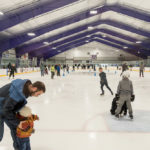 The ice rink floors, refrigeration, electrical switchgear, rink lighting, audio, dasherboards, stands, digital controls, and low E ceiling would be under a refrigeration contractor acting as the prime contractor. The Cubes were chosen the by the ice rink consultant to solve many issues of size and design. A five ice3 Cube System was installed with total reclaim heat. A trimming high efficiency-condensing boiler was installed to back up the Cubes in the unlikely event that heating requirements and cube usage went out of sync. The floor was moved providing more walkway room at the front of house. A warm floor was installed to allow for the potential of year round use. The system was converted to a buried header system and end header trench filled in. All four radiuses were re-poured and regulation width and length were installed. The fact that the Cubes were modular and provided 5 circuits was very important to the operator, as his location on an island did not render itself to parts acquisition in an emergency. 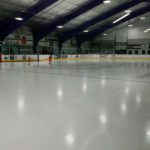 In addition, the ability to reclaim heat and redirect it supplying the warming area, new warm floor, basin heat, as well as Zamboni preheat was a definite means to saving utility costs on propane usage. The Zamboni water after rebate analysis was converted to a realICE water treatment system allowing use of the Zamboni preheat water only. This also lessened the dependence on propane. The Digital Control System applied to the ice3 Cube refrigeration system was also used on the HVAC system so that optimum control of all aspects was had. Both warm and cold pumps as well as fluid cooling tower fan had speed drives. At the end of the day, with digital controls LED lighting, installation of superior insulation realICE water treatment, and reclaim of Cube waste heat the customer was awarded $198,000 in rebate incentives.